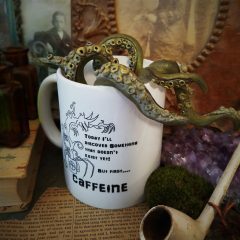 Today’s coffee inspiration – compliments of Dr VonDrachen aka the eminent artist Tiffany Flanagan of Rhode Island. As soon as I sup this drink, I plan on creating something that never existed – but I’m still not sure how many legs it will have. Do you have a coffee mug that inspires you to explore or create in today’s (or yesterday’s) world? If so, email a photo of said mug with a short blurb to me, send it to cheryse(at)quietdawn(dot)org, and I will share it with my readers.